In 1997, Houston entrepreneur Bob McNair had a failed bid to bring a National Hockey League expansion team to the city, and Bud Adams relocated the city’s NFL team, the Houston Oilers, to Nashville where they were renamed Tennessee Titans. Given the Cleveland Browns had just suffered a controversial relocation to become the Baltimore Ravens, the league promised to return football to Cleveland within the following three years, and probably add another expansion team to even out the franchises at 32. As Houston was one of the favorites for the extra franchise along with Toronto and Los Angeles which had lost the Rams and the Raiders in 1995, McNair then decided to join the football project and founded Houston NFL Holdings with partner Steve Patterson. In association with Houston Livestock Show and Rodeo, they would push for a domed stadium as part of the bid to lure the NFL back to Houston. The expansion team was originally awarded to Los Angeles on March 16, 1999, but given the city had problems in providing an acceptable ownership team and stadium deal, both of whom had been promised in Houston for two years, in October the NFL instead awarded the 32nd team to Houston, at the cost of $700 million. 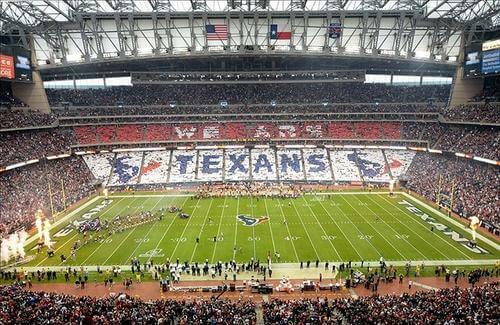 NRG Stadium (formerly Reliant Stadium) is a multi-purpose stadium, in Houston, Texas, USA. NRG Stadium has a seating capacity of 71,054, a total area of 1,900,000 square feet (180,000 m2) with a 97,000 sq ft (9,000 m2) playing surface. NRG Stadium employs two different playing surfaces; a natural grass field is used for professional football games while an artificial surface, AstroTurf GameDay Grass, is used for college and high school games. Both surfaces are laid out on interlocking trays. “J.J.” Watt is an American football defensive end for the Houston Texans of the National Football League (NFL). He was drafted by the Texans with the 11th pick in the first round of the 2011 NFL Draft, and played college football at Wisconsin. 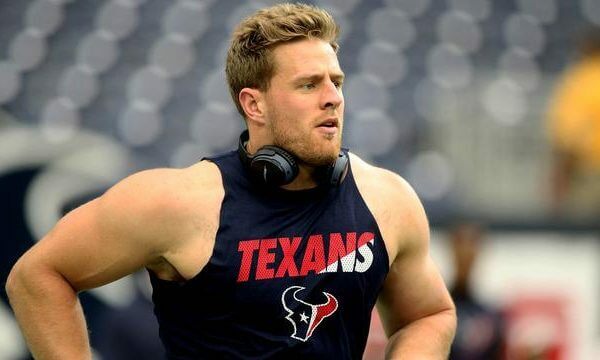 Watt received the AP NFL Defensive Player of the Year Award three times in his first five seasons. Although primarily a defensive end, he occasionally shifts to defensive tackle in some situations. He has also taken snaps on offense, catching three touchdown passes during the 2014 season. In 2014, Watt became the first player in NFL history to record two 20+ sack seasons in a career. He also holds the Texans’ franchise records for both sacks and forced fumbles. The Houston Texans are a professional American football team based in Houston, Texas. The team competes in the National Football League (NFL) as a member club of the American Football Conference (AFC) South division. The Texans first played in 2002 as an expansion team after Houston's previous franchise, the Houston Oilers, moved to Nashville, Tennessee, where they are now the Tennessee Titans, making them the youngest franchise in the NFL currently. The team's majority owner is Bob McNair. While the team mainly struggled in the 2000s, they clinched its first playoff berth during the 2011 season as AFC South division champions. The Texans have gone on to win more AFC South championships in 2012, 2015, and 2016. To date, the Texans are the only NFL franchise to have never played in a conference championship game. Texans - After Houston was awarded the NFL's 32nd franchise on October 6, 1999, a series of focus groups were formed to help come up with a nickname for the team. On March 2, 2000, the team announced five choices, the Apollos, Bobcats, Stallions, Texans and Wildcatters. The list was then shaved to the Apollos, Stallions and Texans a month later. After careful deliberation, the team unveiled the Texans' name, colors, and logo at a rally held in downtown Houston on September 6, 2000.
Who is the greatest Houston Texans?